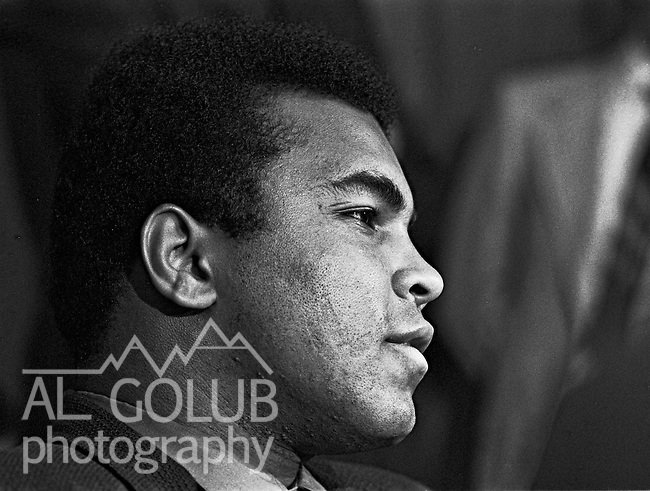 Modesto, California, May 18, 1971.Sportsmen of Stanislaus Club invited Muhammad Ali to speak in Modesto. In the past, the SOS Club had hosted other boxing greats such as Max Baer, Jack Dempsey, Joe Louis, Rocky Marciano and Joe Frazier. One month later in June of 1971, the Supreme Court ruled in favor of Ali on the issue of his draft evasion conviction, clearing the way for him to box and eventually regain his title. SOS was a male-only organization at that time and charged $5.00 per dinner ticket..Photo By Al Golub/Golub Photography.